Online registration closes on July 25 but there is no penalty to register for the conference onsite. Registration opens at 4 p.m. PT Friday, July 29 at the Sheraton San Diego Hotel & Marina. Details online here. Emerging research has demonstrated the benefits of eating higher protein diets (within the context of the Acceptable Macronutrient Distribution Range), particularly related to sports nutrition, weight management and healthy aging. Evolving science is also beginning to examine the effects of protein quality and timing to help further refine practical recommendations to optimize consumption. Webinar sponsored by the National Dairy Council. The 1st World Conference on the Mediterranean Diet took place in Milan on July 6-8 in order to revitalize the Med Diet, from a healthy dietary pattern to a healthy Mediterranean sustainable lifestyle. 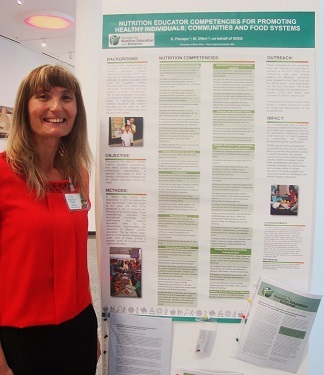 While attending the conference Suzanne presented a poster on the SNEB Nutrition Educator Competencies, mentioned the Competencies during a roundtable, and also during a session she chaired on Mediterranean Diet Interventions. SNEB was recognized as a conference partner. Interview: Collin Payne, PhD, describes how in-store marketing efforts moved shoppers to purchase healthier foods while not increasing budgets. This intervention showed that the produce spending proportion increase is possible without increasing overall spending per shopper transaction and could trigger a public health shift. This is the eighth in a series that JNEB is holding a Journal Club. Based on member interest, the fall series will focus on the topic of Health behaviors across the lifespan: Education, theory and policy. The series is anticipated to begin Sept. 12 and be held at noon ET each Monday. The webinars will host nutrition education and health behavior experts who will share their research that uses education, theory and/or a policy approaches focused on improving the health of individuals across the lifespan. These informative educational workshops will provide valuable learning opportunities for participants to learn the latest hot topics in the nutrition and health field. Participants can also receive CPEs by attending these educational webinars.